The Hypodown 600 Fill Quality Down Pillows has been discontinued. 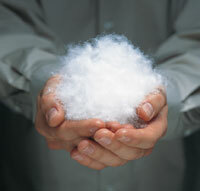 All Hypodown pillows contain the finest quality white goose down, guaranteed to be hypoallergenic. These Hypodown 600 Fill Down Pillows are 70% goose down (75% down clusters/25% down pieces) and 30% Syriaca Clusters. Hypodown is a natural, hypoallergenic combination of white goose down and Syriaca clusters that is warmer, more breathable, and more durable than down alone. 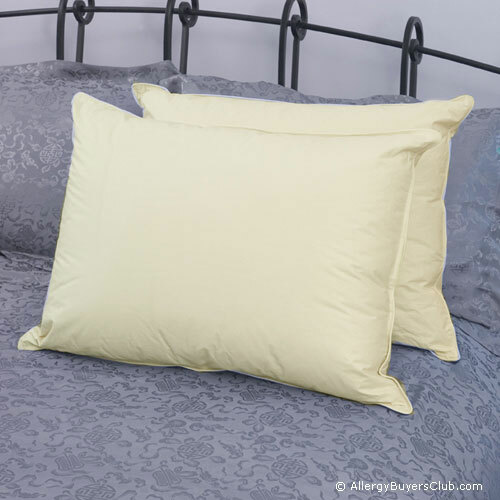 These beautiful hypoallergenic pillows feature a 312 thread count, 100% cotton cover that is unbleached, undyed and chemical-free. The patented Hypodown fill is an innovative blend of 70% of the finest white goose down (contains 75% down clusters and 25% down pieces) combined with 30% all-natural Syriaca Clusters with the seeds removed. The unique Hypodown mix is guaranteed to be allergy friendly. Available in soft, medium and firm to provide optimum comfort and support for stomach, back and side sleepers. 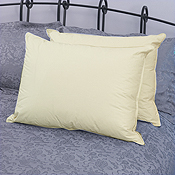 Hypodown 600 fill down pillows are premium down pillows. 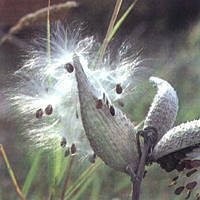 They have a minimum of 70% down clusters and are mixed with soft Syriaca clusters for a soft and lofty feel. 600 fill Hypodown is the most affordable Hypodown fill because it contains less down clusters and more down pieces. The 600 fill Hypodown pillow may be the lowest quality Hypodown, but these pillows are still a far better feeling than those you find at a department or big box store. They are soft, fluffy and cradle your head and neck like a luxury down pillow should. These quality pillows will undoubtedly last a long time and for an allergy sufferer, the fact they are guaranteed not to trigger allergies is an unbelievable bonus. Hypodown pillows remain our company's favorite down pillow year after year.